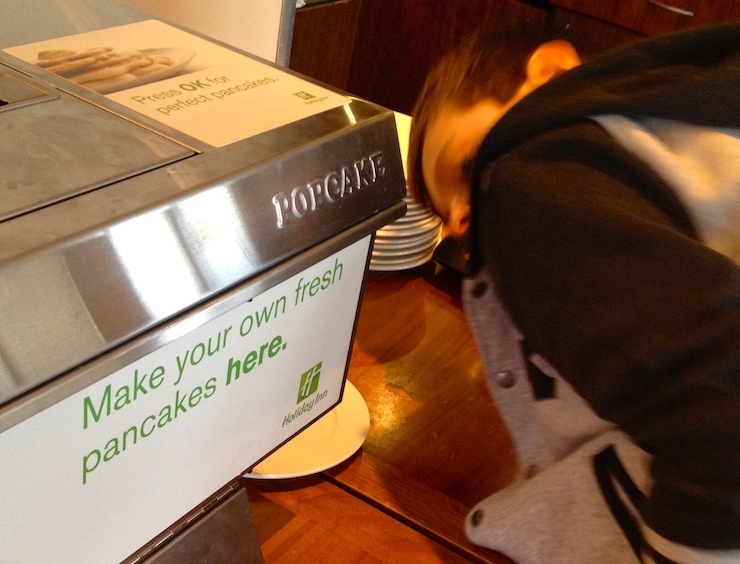 My youngest is very pleased when he reads the notice at breakfast: ‘Make your own fresh pancakes here’. The sign is on a silver box-like machine in the restaurant of the Cambridge Holiday Inn. My son presses the button on the front of the machine, puts his plate to the side of it and waits expectantly. After a couple of minutes a small, round pancake drops onto his plate. He smothers it in chocolate sauce and devours it happily. Meanwhile my husband is reading the i newspaper and eating a bowl of fresh fruit. Apart from the pancake machine, all of the usual breakfast options are on offer. I go for scrambled egg and mushrooms and, pancake inhaled, my son is thrilled to find a mini packet of Coco Pops amongst the cereals. The joy of hotel breakfasts for him is eating his weight in things we never have at home but for me it’s letting someone else do the work while we sit down and eat together. We’re staying in the hotel in a double executive room with a sofa bed for the youngest: the eldest is on a school ski trip. The room is comfortable if a little snug with the sofa bed extended. The decor is neutral with good quality furnishings: a large pale wooden desk, white cotton bed linen and, something I really like, sliding wooden shutters instead of curtains. Our room has all of the gadgets you might expect: a safe, a chargeable minibar, an iron, a trouser press (does anyone ever actually use these?) and a TV. The only gadget I ever really want in a hotel room is there too – a kettle. When we arrive there’s a welcome KitKat left for us next to the kettle too which is appreciated but I wish there’d been one for each of us. Guests are welcome to use the hotel’s health club with its gym, 15-metre indoor pool, jacuzzi, sauna and steam room. The pool is busy when I go but there’s enough room for everyone. 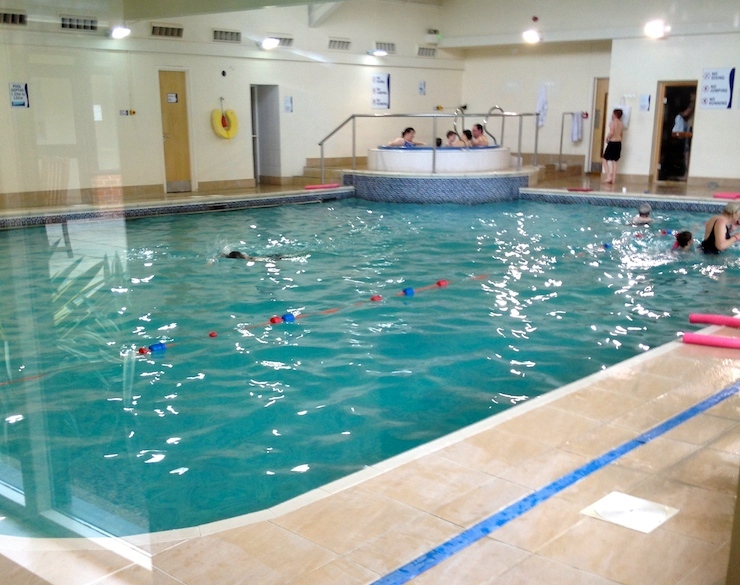 It’s divided into two sections so that those who are swimming lengths are separated from the kids who are just playing. There’s no lifeguard at the pool when I’m there, so you’d definitely need to keep an eye on your children in the water. After my swim I have the sauna and steam room to myself while my husband finds just two other people at the gym when he goes there. There’s plenty of comfortable seating in the public areas of the hotel, a children’s play area is enclosed in a central courtyard and there’s lots of free parking outside. The staff we meet are all very helpful and friendly. After breakfast the restaurant serves food until 9.30pm and there’s also a bar at the hotel which serves snacks and light meals. I think this is a good place for families to stay apart from the fact that there’s no free WiFi available anywhere. If you want to pay for it, WiFi access will cost you £5 an hour, £10 for four hours or £16 for 24 hours, which I think is pretty steep. 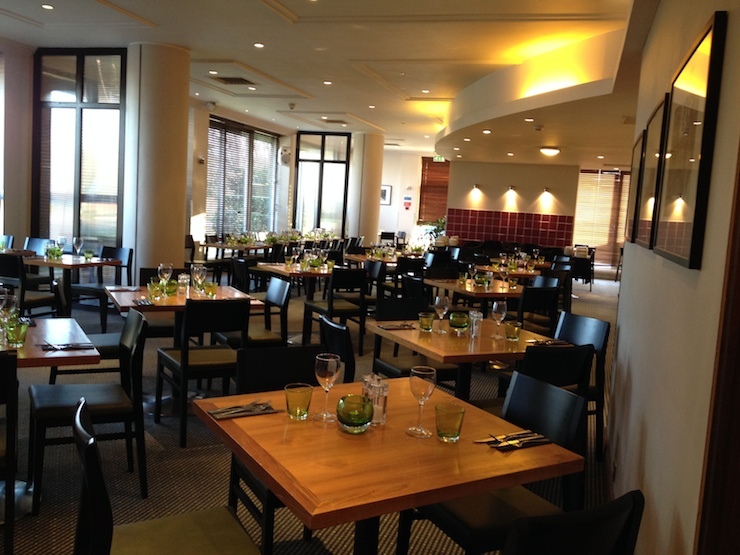 The hotel is in a quiet spot in the village of Impington, just outside Cambridge and makes a good base for families exploring the city and the surrounding area. Cambridge has some great family-friendly places to visit including the Fitzwilliam Museum, The Polar Museum and the University Botanic Garden. The Imperial War Museum at Duxford and the National Trust’s Wimpole Estate are also nearby. We stayed in a double executive room with a sofa bed at the Holiday Inn Cambridge as guests of the hotel for the purposes of this review. The room costs from £69 per night, including breakfast. 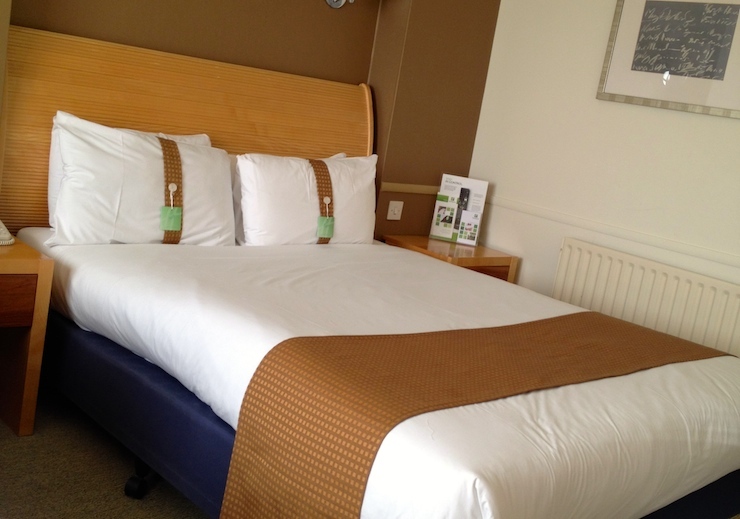 Family rooms cost from £74 and cots are available free of charge but must be requested at the time of booking. Children under 12 sharing a room with their parents stay and eat for free. I’m looking for a place to stay near Cambridge for their litarary festival in November. I’ll definitely bear this in mind…. Love the idea of the pancake machine, but only one kit kat? Terrible! Cass@frugalfamily recently posted…Girls Only Night – Quick and Easy Non Alocoholic Mojito mocktail recipe…. That pool looks lush! Would definitely love to jump in there with the kids! £74 for a family room is such a bargain – and a pool too! Always great to read family recommendations of family friendly places to stay! Wow, the pancake machine is worth the visit alone. It’s a good price for a family trip to explore another city. But you’re right about the KitKats – just getting one would cause no end of squabbles in my family. Boo to the one kit kat but the pancake machine? Wow. Want one of those at home. I didn’t realise that some Holiday Inn hotels have swimming pools. I love swimming so this is a real bonus for me on a holiday. Add to that a pancake machine and it is hard to complain! We love staying in hotels with a pool, thanks for the tip. I lived in Cambridge for 11 years, following on from University there. We got married nearby and had our wedding night at the Holiday Inn! Lovely hotel – we treated ourselves to a night there a couple of years back for old times sake. I love hotel breakfasts. Fresh pancakes would be my hotel breakfast heaven! I have stayed in lots of hotels, but I have NEVER seen a pancake machine, amazing! Priya Tew recently posted…Chewy Oaty Cookies: great baby/toddler snacks. i’ve never stayed in a hotel before! that pancake maker sounds intriguing. How cool you had me at pancakes, I agree the Kit Kats should be for all guests staying. Not abd price for a family room. That looks like a great hotel at a very reasonable price. I would love to make my own pancakes too! That really looks good. Definitely one to consider when we visit Cambridge. A pancake making machine?! I’m sold! The pool looks lovely too.